Many of us are experts when it comes to picking our own stocks or investments. Others, simply don’t have the time to take to research and analyze investments to invest in. I personally love the process of picking my own stocks and other investments to invest my money in. But I understand everyone has their own interests and that many people are not interested in investing. Even if you hate the thought of investing or don’t understand the fundamentals of investing, it’s still very important for you to have investments. Fortunately, I stumbled upon a service that makes investing easy! We’ve found a service that will do your investing for you! The service is called Betterment. Founded in 2008, by its CEO Jon Stein, who wanted to find a way to invest that was accessible to everyone. Jon worked in the financial services industry and was surprised to find out that no one had yet offered a service for people to save and invest money that was simple and stress-free. So he decided to start Betterment. How does Betterment work? 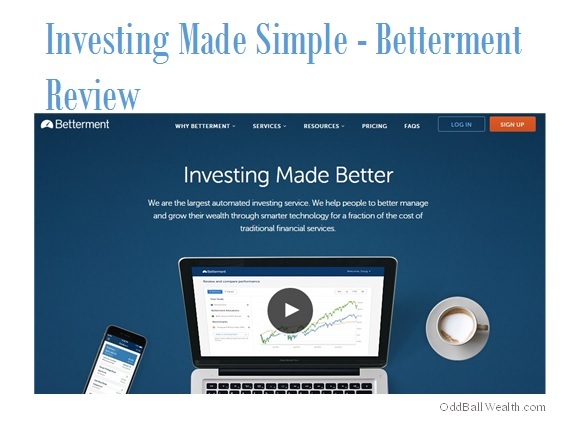 It’s really simple, Betterment will invest your money for you. The investments made are based off of your personal preferences, risk level, and portfolio allocation. Based off all of your preference they’re then able to pick exchange-traded funds (ETFs) to invest in on your behalf. Betterment will make your life easier and less stressful now that you no longer have to worry about investing your money. They will do everything for you! So you no longer have to do your own research and management for your investments. They have two investment options for you to choose from, which are stocks and bonds. I was pretty surprised when I found out just how low Betterment’s fees are. The cost of using their service is based on the amount you have deposited and the frequency of your deposits. They charge between 0.15% to 0.35% of the amount you deposit. That’s very cheap to have someone else manage your money for you. There are no hidden fees, costs, or minimum balance requirements. The only fee you pay is the initial cost as I stated above of 0.15% to 0.35% on the money you deposit. So, the most you would have to pay for every $100 deposited is 35 cents! I would recommend setting your account up for automatic deposits each month. Betterment makes investing easy and inexpensive this way. If you have extra money sitting in a savings account, consider investing it with Betterment! Interest earned on a savings account is extremely low, generally only earning you pennies a day. The ten-year average return for the stock market is 10%, making it more logical to have extra money invested in the stock market. There’s obviously more risk involved, but I would rather take on addition risk and earn more money, than to leave my money in a savings account and lose money to inflation. You can withdraw your funds at any time, making the service flexible for those who will need to withdraw their money at a certain time. Click Here to Open a Betterment Account Today!